The Apollo 10 astronauts climbing out of the Charlie Brown command module. 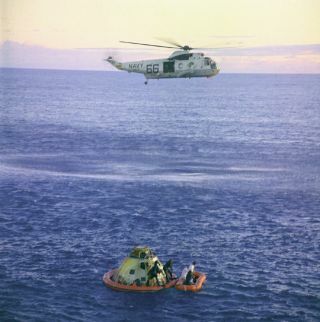 In this historical photo from the U.S. space agency, a Navy helicopter arrivies to recover the Apollo 10 astronauts, seen entering a life raft, as the Command Module "Charlie Brown" floats in the South Pacific. U.S. Navy underwater demolition team swimmers assist in the recovery operations. Splashdown occurred at 11:53 a.m., May 26, 1969, about 400 miles east of American Samoa. Note that in this photo the divers have attached a flotation collar to the spacecraft.